This assurance has been given by Pearl Williams, Co-ordinator of the pageant, which will be held at the Cruise Ship Berth from 8p.m. Seven beautiful, full figured women will grace the stage as they vie for the coveted title, which will earn them the right to contest in regional and international competitions. The three top contestants from the show will also be participating in the Pulse Reality Show in Jamaica, and the winner will receive a scholarship to pursue studies at the House of Jacqui in Trinidad and Tobago. Williams said the contestants have been receiving good reviews from the public and the sponsors are quite impressed. âI think it is the first time the sponsors are competing even more than their girls,â said Williams. 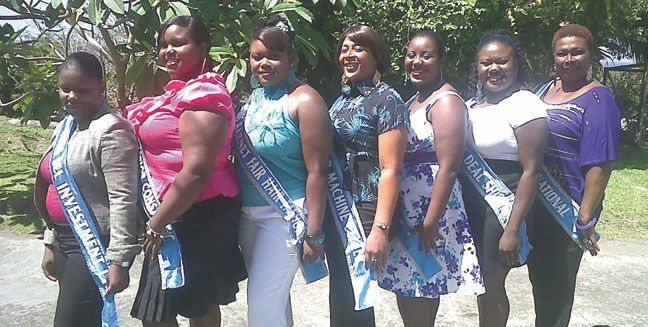 This yearâs contestants are Laverne Baptiste, who will represent Oscar Machine Centre; Elcitha Franklyn, Karibbean Tire; Avalon Caesar, Irvin Interior & Construction; Nikiesha Ryan, Sel Investments Ltd; Jacquelin Keir, Uptown International; Kishmar Alexander, Square Deal Shippers, and Emrist Hadaway, Barnetâs Fair Hair Fashions. Williams said she is satisfied with the interviews that the young women have done so far, which were fluent and allowed them to showcase their intelligence. Leading up the show, the contestants received the opportunity to meet Prime Minister Dr.Ralph Gonsalves and members of his Cabinet, as well as visit the International Airport construction site at Argyle. Franklyn, a resident of Barrouallie/Prospect, said patrons can expect the best from her and her fellow contestants. Caesar, who hails from Lowmanâs Leeward, said she has a positive message for patrons and they can expect fun and laughter. âI will encourage patrons to come out and have fun. They will see beauty, talent and style,â said Ryan, a resident of Calliaqua. Keir, a resident of Campden Park, told SEARCHLIGHT she and her colleagues are seven of the most beautiful full figured women in St.Vincent and the Grenadines, and tonight, they cannot afford to miss the show, because they will be missing beauty, fun, entertainment and laughter. Alexander sent a special invitation to all full figured women to support the pageant. She said the pageant will help to boost the self esteem of all heavy set women. âWe are not less; we are more. The more you get itâs the better,â said the Redemption Sharpes resident. Hadaway, on the other hand, said the contestants will help patrons to understand that beauty comes in all sizes. The New Montrose resident added patrons will get an opportunity to see beauty at its best. The judging categories are: Introductory Speech and Occupation Wear, African Wear, Talent, Interview, and Evening Wear. Special thanks were given to trainer Anthony Jack of the Mustique Company and the management and staff of Haddon Hotel.